I’m venturing down to Brighton for World Fantasy Con on Thursday, or Halloween! It turns out there will be 11 clients of Juliet Mushens there, so to celebrate, fellow Mushenite Andrew Reid has been coordinating a few spooky shorts that some of us are putting up on our blogs prior to WFC. My story ties into a WIP that’s currently on hold as I finish up another project and do more research into the time period. But dipping back into it for this reminded me how much I love the setting and the mythos, and I look forward to getting back to it. This short is told from the POV of one of the secondary characters of that novel. I hope you enjoy it. They said Castle Dunoir was haunted. The people in the nearby village of Allise Oir gave Irene Lewis sidelong looks when she said she’d found employment at the castle in the Highlands. She’d moved to the village from Aberdeen a few months ago, and her aunt and uncle’s crofter’s cottage was a far cry from the comfortable mansion in Rubislaw Den. Irene helped out, but she was no farmer. She was a lady’s maid. So she trudged the five miles and knocked on the door to the Baroque castle crouched in the middle of the loch on a rocky peninsula. The gamble worked. Before the week was out she’d moved her carpetbag from the crofter cottage to the castle. 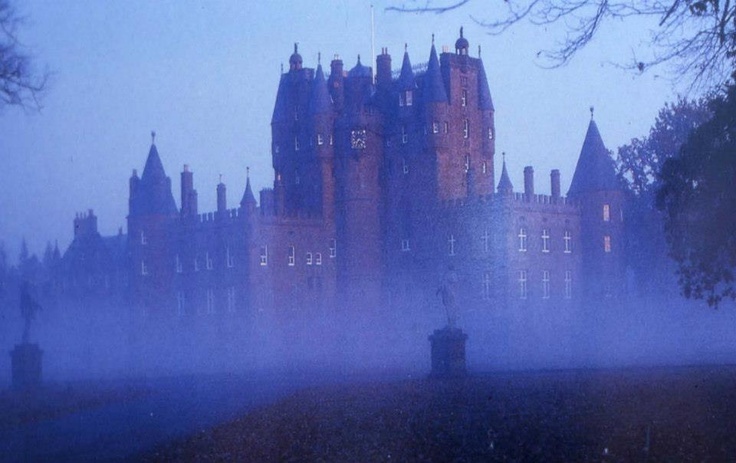 The castle was understaffed, even if only Lord and Lady MacLain lived here with their son, Archibald. They never entertained, and Lord MacLain was often away on business. The lady of the manor floated through the corridors, looking a little fey. She spent a lot of time staring out of windows at the loch, as if searching for something in its depths. The son stayed in his room most of the time, and he must have been the loneliest boy Irene had ever met. As Irene did her chores, she could swear she was being watched. The hairs along the backs of her arms and neck would prickle, and every few minutes she’d give in and look around. Before long, her nerves were frayed. She noticed the cook, Maura McCray, took a medicinal dose of sherry every night before she left the warmth of the kitchen to brave the dark hallways. No one spent more time alone than they needed to. On Hallowe’en, the housekeeper, Mrs. Fraser, asked her to fetch more petrol from the cellar to help light the bonfire. They could have brought up the petrol in daylight. Irene recognised it for what it was: a test. “Come on, lass, surely you can brave the wee ghosties so we can drive the dark away with the bonfire? Ye’ll be the hero of Samhain!” Alan Ramsay, the groundskeeper, teased. The others chimed in. Irene volunteered readily enough, squaring her shoulders. “Dinnae let the Sìth or the spirits find you on the way and hurry straight back, lass,” Maura whispered, giving Irene an oil lantern to take with her. “Aye, I’ll try, Mrs. McCray,” Irene laughed. Mrs. Fraser told the cook to hush, but Alan the groundskeeper and the footman, Andrew, also wished her luck. In the dark of the corridor, she wished she’d said no, even though that wasn’t an option. The hallways were frigid, lit only by her lantern and the flickering lights of the occasional tumshie lanterns, the hallowed out turnips Maura had carved with ghoulish faces and placed about the castle, much to Mrs. Fraser’s annoyance. As she reached the side entrance to the castle, she took a coat from the peg by the side entrance to the castle and wrapped it around herself. Outside, the stars peppered the sky, the west patch of sky coloured the red and orange of dying embers. It felt more like January than late October. Maura had also left a small bowl of wine and a plate of soul cakes by the door, an offering for the spirits. Rubbing her hands together, Irene scuttled across the frosted ground, and pulled open the wooden door to the cellar with a creak. It seemed as dark as the devil’s waistcoat down there, and she didn’t want to go. “I’m nae afraid,” she whispered to herself, fiercely, and held the lantern out as she made her way down into the cellar. It smelled of frost, mouldering vegetables, dust, and wood shavings. The petrol bottle was on a shelf just by the ladder, and she grabbed it, tucking it under the arm and scurrying back up the ladder. The wooden door of the cellar fell shut behind her. Irene smiled. She had done it. She turned around, and the smile faded as she swallowed a scream. In front of her was a man who definitely had not been there before. And he didn’t have a face. She stumbled back, but the man staggered forward, one arm outstretched. He wore boiled leather and chainmail trousers, and the front of the metal-studded tunic was stained dark with old blood. His head was framed by a mane of unkempt hair, but his face was a ruin of blood and bone, breath gasping wetly from the hole that had once been a mouth. And he was transparent, made of grey and black, with small specks of gold. Yet he still looked solid enough that Irene feared he’d do her harm. “Buggering Jesus!” she screamed. She dropped the lantern and it sparked out. The man did not react but only came closer, the wet snuffling growing more frantic. As if he could smell her. Instinct took over. Still clutching the can, she dodged the figure. He moved quicker than she expected. His arm reached for hers, but his fingers went through her, though they were colder than snow. She screamed and ran faster, throwing open the side door, darting inside and slamming it shut. She leaned against but then worried that the ghost would come through the door. Irene ran back to the warmth of the kitchen, the footfalls echoing around her, the carved faces of the tumshie lanterns leering at her. Andrew was putting two chestnuts in the fire as she entered the kitchen—one for him and one for the girl from the village he was seeing. Before they could see if the nut hulls burned steady and bright, they all looked up, ready to make a merry joke, and then they saw the look on her face. Irene set the petrol on the table with a thump. One of the chestnuts popped in the fire, and Irene flinched. She sat as close to the fire as she dared, shivering, her teeth chattering in her skull like dice in a cup. She still felt the cold imprint of the faceless man’s hand on her arm. Mrs. Fraser ordered the servants to start the bonfire, and they all left until only the housekeeper and the cook remained. Maura knelt down beside Irene and passed her a glass of whisky. She gulped it down, though it did nothing to warm her left arm. “Ye saw something out there, didn’t ye?” Maura whispered, stroking Irene’s hair back from her face. “Fit did ye see, quine?” she repeated in her Doric accent. The housekeeper knelt down, so close to Irene that the younger girl wanted to lean away.